Sometimes combinations of chemotherapy drugs are used to treat pancreatic cancer. In this instance, GemCap is made up of Gemcitabine and Capecitabine. 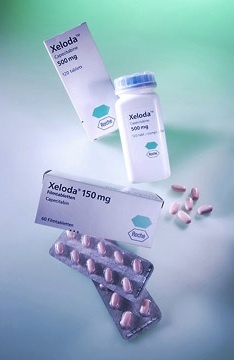 Capecitabine, also known as Xeloda®, is a type of chemotherapy medicine for cancer known as a ‘cytotoxic antimetabolite’. It is taken in tablet form by mouth and is converted inside cancer cells to 5-fluorouracil (5-FU), the active form of the medicine. Chemotherapy is mostly given in cycles of treatment with each cycle lasting 4 weeks. It is usual for patients to be given six cycles of treatment over a 6 month period. Weekly intravenous infusion of Gemcitabine plus 1 tablet of Capecitabine twice per day for 3 weeks then a break with no treatment for a week. Then the next cycle will begin. Capecitabine is usually given as a combination of 500mg and 150mg (peach coloured) tablets. You need to make sure that you are taking the right dose at the right time. Capecitabine works best when it’s broken down in the stomach with food, so it is best to take your tablets, with water, within 30 minutes of finishing a meal. The doses should be spaced apart, so it is sensible to take one dose in the morning with breakfast and another just after your evening meal. If you have trouble swallowing, the capecitabine tablets can be dissolved in warm water. Stir the mixture until the tablets are completely dissolved, then drink immediately. It’s important you keep the glass and other equipment used to dissolve the tablets away from those used by other members of the household. Capecitabine can cause higher levels of bilirubin in your blood Bilirubin is a chemical that is released into your blood, which results from the breakdown of red blood cells. Bilirubin is used by the liver, to make bile. Your doctors will be monitoring your levels of bilirubin in your regular blood tests before each chemotherapy session. Click here to read about other chemotherapy drugs for pancreatic cancer.